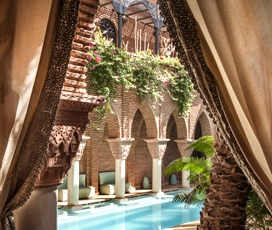 "Embrace the culture that this charming city has to offer and be sure to visit The Medina..."
One of the most captivating cities not only in North Africa, but throughout the world, Marrakech lies close to the foot of the Majestic Atlas Mountains and just a few hours away from the Sahara desert. 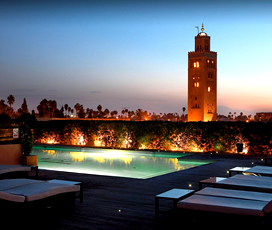 There are 2 contrasting parts of the city, the Medina, which is the historical centre of Marrakech where you will find the famous souks, narrow streets and endless charm, and the modern district called Ville Nouvelle or Gueliz, which boasts modern restaurants and shops. 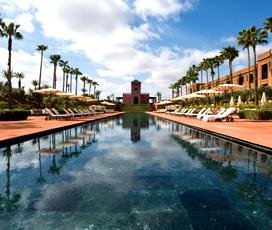 Marrakech makes for the ideal cultural city break or family holiday, where you can relax in ultimate luxury or experience staying in an old Arabic mansion (Riad). 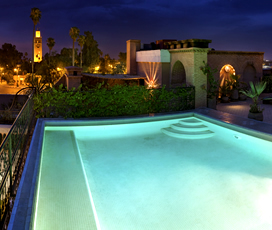 A cultural hub in every sense of the word, Marrakesh has everything that you could ever want. It is a sensual experience unlike any other with the smells of the spices, the call of sellers, and the colourful painted glass, ensuring that it is an empirical feast to be savoured. 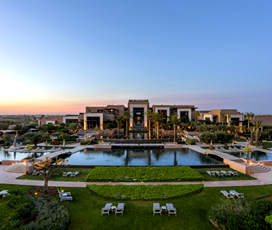 It is a place where you can shop and eat to your heart’s content; see the glories of the rose-walled medina and journey up to the towering Atlas Mountains. It is crammed with World Heritage Sites and is a one-of-a-kind city that will steal your heart and make you want to return over and over again. 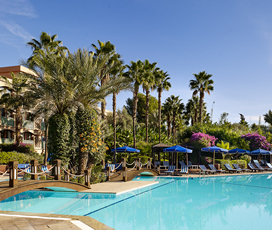 A vibrant and historic city nestled in the foothills of the Atlas Mountains its important strategic location has always meant that the city has been an economic powerhouse. 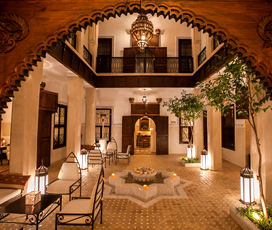 It is most famous for its bustling Medina that dates back to the famous Berber Empire, which plays host to a vast array of souks and narrow passageways. The massive minaret of the Koutoubia Mosque dominates its skyline and can be seen from pretty much everywhere in the city. It is also fairly large with a population of just under one million. 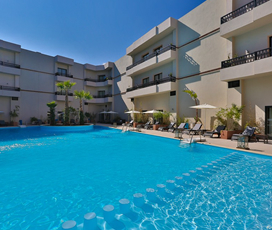 Its hottest months are July and August, when temperatures average close to 30 degrees, although its inland location can make this slightly oppressive. The best time to visit is just before then, meaning that from late March to early June and September to October are ideal. The winter months are mild with a lowest average of 13 degrees, ensuring that this vibrant city can be visited throughout the year. 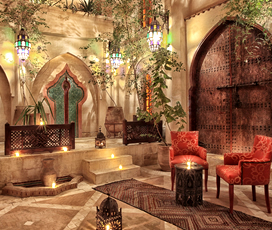 Built in 1062 by the Almoravid dynasty, it spanned the massive expanse of land between the Maghreb Desert and Europe. 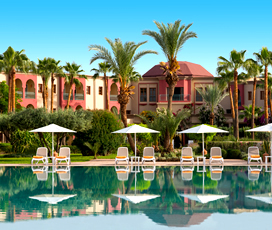 Its important strategic location at the foot of the Atlas Mountains quickly made it one of the largest and most prosperous in the country. It was captured by the Almohads in 1147 and this was when the famous Koutoubia Mosque was constructed. It then fell to the Merenids in the middle of the 13th century, who made Fes their capital, meaning Marrakesh far less important. By the middle of the 16th century the city was close to being in ruins and was taken over the Saadians, who swiftly restored it to its former glory. It quickly grew to be the richest city in Morocco again, until it was captured by the Alaouites in 1669, who moved the capital back to Fes. The city was then captured by the French and governed as a protectorate until 1956, when it was liberated by Mohammed V and became a wealthy and sophisticated tourist destination. The city is a great place to take children of all ages with a host of different activities that will excite and delight in equal measure. 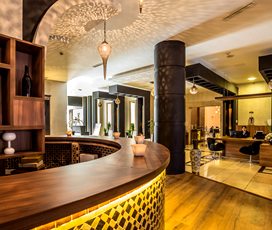 There are loads of companies throughout the city, offering children’s cooking classes: ideal for introducing them to Moroccan cuisine in a fun and educational way. For those seeking more of a thrill then you could take a Hot Air Balloon ride over the city and nearby Atlas Mountains, take them for a camel ride or explore the city in a traditional horse and cart taxi. 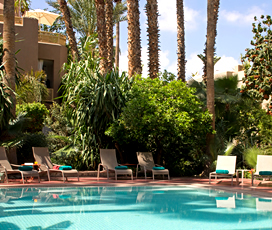 While Marrakesh is also dotted with a series of excellent gardens, where children can play safely and learn about the local flora and fauna on their family holiday. The Jemaa el Fna square is a World Heritage site, with a proud performance tradition: there you will find actors, animal handlers and much, much more, making it a must-see during your time in Marrakesh. 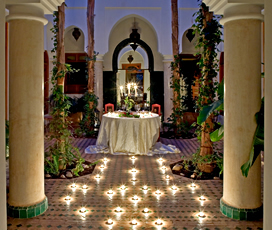 The Bahia Palace is a glorious 19th century building situated in the centre of the city with expansive gardens that is another must-visit. While no trip to Marrakesh would be complete without seeing one of the many meandering Souks, where local traders sell their wares. 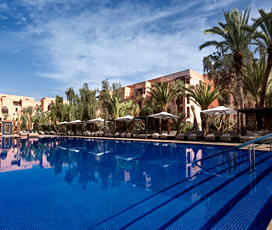 Further afield, you could go and explore the towering Atlas Mountains, whose shadow Marrakesh sits in. Suffice to say there is something for everyone in this incredible city. The centre of Marrakesh tends not to be especially vibrant as it is considered blasphemous to consume alcohol close to the Koutoubia Mosque. However, there are still plenty of great nightclubs and bars slightly removed from the centre of town. 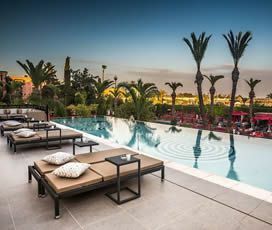 The best action is found close to the Mohammed V Avenue, where there are a host of trendy bars, serving elegant cocktails. 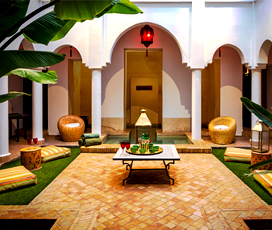 There are also many great restaurants serving traditional Moroccan food and drinks, ideal to sit and relax in, under the shadow of the Atlas Mountains. The many souks that populate Marrakesh’s Medina are famed for the amazing leather products, colourful glasswork, handwoven carpets and rainbow-coloured tiles, ensuring that it is a shopper’s paradise that everyone should visit. To shop in souks, it is absolutely vital that you haggle, the display price is almost always bigger than the actual value of the item. It is generally recommended that you start at around 60% lower than the initial asking price and try to drive a hard bargain, because sellers will never sell an item at a price that is not beneficial to them. If shopping at souks is too intimidating, then head to the Gueliz area, where many of the prices are fixed (although more expensive).